56 Stunt - Vacation at grandmothers. Time - May 23 to June 3. Place - Murdock, Ill & Vacinity. Went to grandmothers the day after school was out. Stayed 11 days. Met several nice kids - Ray Jones, & Eddie Jonnes among them. We were in Champagne Urbana, Bloomington, Clinton, Crisman, Newman, Villa Grove, Camargo, Tuscola and several other towns around Murdock. Had two parties given in our honor - one by Ruthie Porterfield & one by Lloyd Wayne Their was also a Major Bowles program in which Ruth & I participated. Saw two shows while there. "[Fallow the Flut?]" and "Absolute Quiet". Both good. The climax, I think, was the fish. we got home June 3 at 8:00. A grand time was had by every one in general & myself in particular. 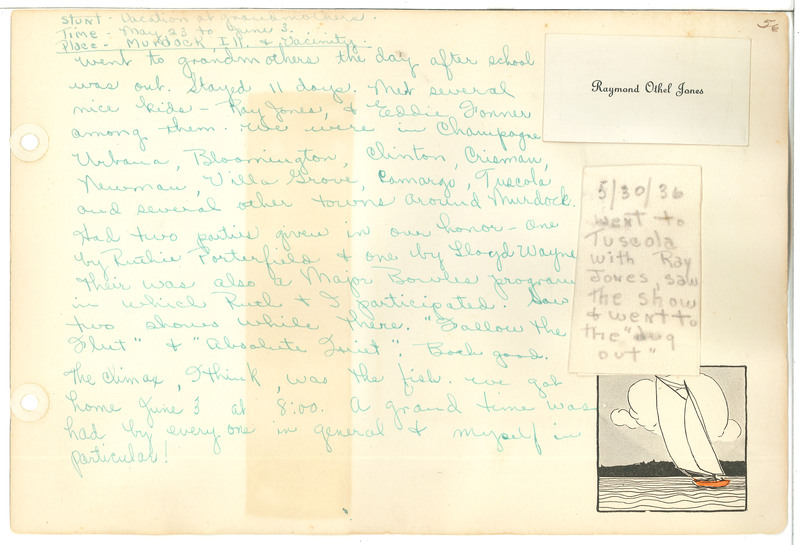 Raymond Othel Jones 5/30/36 Went to Tuscola with Ray Jones, saw the show & went to the "dug out"